I hate to say “I told you so”… but I TOLD YOU SO. Want my name or my logo? Your Facebook personal profile must use your name. Not a business name, not your nick name, not a made up name, but your actual name. While the policy has come under heat lately, there are some valid reasons for the rule. According to Facebook, ” Facebook is a community where people use their authentic identities. We require people to provide the name they use in real life; that way, you always know who you’re connecting with. This helps keep our community safe.” You can read the rest in Facebook’s name policy. I like connecting with people on Facebook. If I wanted to connect with a brands, I’d go like a page and pay attention to it. I enjoy meeting the faces behind the logo and want to put a real name to that face. I do business with people, even if I write the check out to a brand name. Don’t you? Recently a business associate of mine found himself locked out of Facebook. When asked to verify his name, he could not. His Facebook name was “D.J. Tim Smith”. While Tim Smith (not his real name, I am using it for example purposes) is his name, the D.J. portion is simply a job title. That’s a big no no in Facebook’s world. In the end, he was reinstated by removing the title and using his actual name. Facebook suggests you create a business page for your business name and / or title. Facebook does give you the opportunity to change your name, and does allow for nicknames, maiden names, etc. Look under your settings and click EDIT by your name. NOTE – you can only change your name once every six months. I’ve worked with a number of businesses and not for profits to transition their personal profiles to business pages and in changing the personal profiles from business name to their actual name without a big loss in fans / friends or followers. 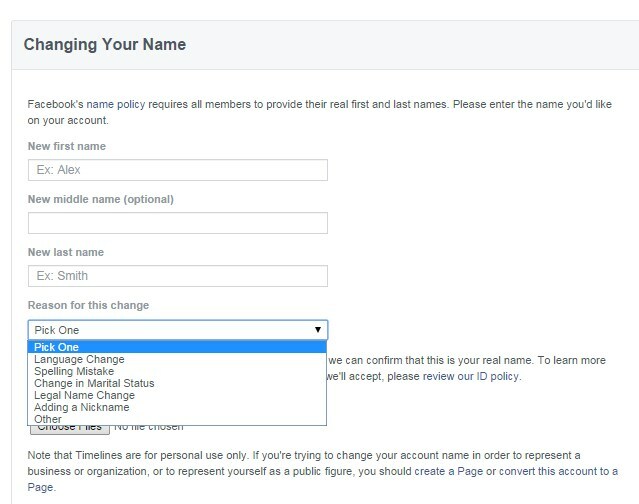 If you are still using a business name on a personal profile, you must consider making the change soon or risk having your profile shut down for violating Facebook’s Terms of Service. You have invested time and effort in building a community on Facebook, therefore it behooves you to play by the rules instead of sacrificing those efforts thinking you won’t get caught. We are users on Facebook. The “fee” for using this free service for marketing or making personal connection is, we have to play by their rules. What are your thoughts on Facebook’s policy? As always, if I can be of help, feel free to contact me.